A big warm (almost HOT!) hello from New Jersey to all of my cherished programmers across the States! It’s Andy Gesner and the staff from HIP Video Promo, bringing you a video courtesy of the social-networking site that has been called everything from a virtual village to the MTV of the 21st Century. One thing is unquestionable: MySpace has exposed millions to music that would otherwise have gone unheard. For many artists – even successful ones – the MySpace page has taken the place of a traditional band website, and you’d be hard-pressed to find a contemporary musician who does not maintain some kind of presence on the social network. It’s a place to share music, ideas and sketches, and, more recently, video clips of bands in performance. The network has become a major player in the music industry, and it’s beginning to behave like one. Tom Anderson and his team have put together their own independent label, and they’ve turned their attention to the further promotion of some of the most popular bands on the site. With close to one million friends, Sherwood certainly qualifies. And judging by A Different Light, their dazzling debut for MySpace Records, their renown is destined to spread far beyond the Web. 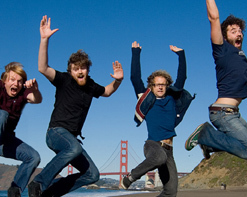 Indeed, the San Luis Obispo quartet is no Internet phenomenon. They’re Warped Tour veterans, and they’ve played to sold-out houses all over America; they are currently on tour with Mae and Relient K, and later this summer, they’ll be hitting the road with Motion City Soundtrack. Their much-loved 2005 debut album Sing, But Keep Going announced the arrival of a multifaceted combo: a contemporary band that loves The Beach Boys as much as The Get-Up Kids, and who’ve got the rich vocal harmonies and sun-drenched California melodies to prove it. Alternative Pressnamed them one of “22 underground bands that won’t stay underground for very long”, and the band will be appearing alongside MySpace head honcho Tom Anderson on an upcoming edition of TRL. On A Different Light, they’ve added dizzy synths to their modern rock, and the resulting hybrid is something singular – reminiscent at times of hellogoodbye’s romantic electro-pop or Rooney’s psychedelic beachscapes, but more elastic than either of those excellent groups. “Song In My Head”, the lead single, is the undeniable rock anthem and inevitable radio hit, but A Different Light also contains letter-perfect electropop (“The Best In Me”), fascinating electronic experiments (“Alley Cat”), dazzling summer-funk (“Give Up!”) and pure statements of purpose (“A Different Light”). If you find another 2007 modern-rock album that covers more territory with grace, we’d certainly like to hear it! Directed by Sherwood guitarist Nathan Henry with help from his bandmates, the video for “Song In My Head” is a sun-drenched reverie, and a whimsical look at the “making” of a band. In the clip, the four members of Sherwood are imagined as paper-doll cutouts animated by a pre-school kid. The child constructs a shoebox diorama on the floor of his suburban home; inside the “room”, the musicians are dressed in brown paper and given huge cardboard instruments to play. Scraping their fingers over strings drawn on by magic-marker, the quartet moves like marionettes. Later, the boy brings the shoebox out onto a lawn – and when other kids start to chase him, the four members of Sherwood are flung against the brown paper walls of the box. A twig tossed into the diorama becomes a gigantic log crashing down on the cardboard drumkit; a little girl stops to lend a hand and dresses the figures in roughly-cut pink floral outfits. Finally, the little boy and girl carry the band with them as they race off into the sunshine – their song still echoing across the open meadows. We’re so very excited to at last be working together with MySpace Records’ Danny Ornelas to promote this marvelous and heartwarming clip. We’ve recently had a chance to hang with Sherwood here at HIP HQ, and with the band being on tour non-stop through August we can assure you that they’d be terrific for a video interview or video ID, so let us know if we can help set you up! The folks at MySpace Records have also been kind enough to set us up with autographed copies of their album, A Different Light that would make for a perfect on-air contest or giveaway, so don’t be shy about reaching out! If this band is getting you excited (and we’re sure they will), call Andy Gesner at 732-613-1779 or e-mail us at info@HIPVideoPromo.com so we can cater to all of your Sherwood needs!